Google’s recent improvements to Gmail’s labels broke one of Better Gmail 2‘s most-loved features: Folders4Gmail. Folders4Gmail displays labels with slashes in them as subfolders of a parent label, and I must say, I’ve missed it a whole lot this week. Luckily, rockstar userscripter Arend v. Reinersdorff updated Folders4Gmail to work with Gmail’s new drag-and-drop, hide-and-show label mechanism, and I just posted his new version in the extension. Grab the newest version 0.8.3 of Better Gmail 2 to get back Folders4Gmail functionality as well as Hide Spam Count. Check out what Folders4Gmail looks like in action in the screenshot. 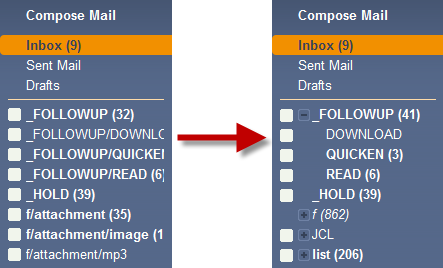 Arend recommends showing all your labels to get full-on subfolder action with Folders4Gmail enabled. Until Mozilla Add-ons approves the newest version of Better Gmail 2, check off “Let me install this experimental add-on” next to version 0.8.3 here: Better Gmail 2. I’m not currently a Better Gmail user, but… would it be possible to add an option to “always show labels with unread messages”, even if the labels are currently hidden? I’m thinking that this sort of thing is probably up to the Gmail team itself, but it can’t hurt to ask. Thank you so much. I’ve been crying about the lack of this functionality all week. Do you know of any userscripts out there that allow you to “archive” a label? I would basically like to toggle something for a label that would make it so that it only appeared on the label settings page. My main reason for wanting this is because I have some number of labels that were used for temporary research (a purchase, a long finished class, etc) and I would like to be able to go back to the labels in the future, but it is so rare that I would rather not have them cluttering the list when I choose “[N] more” on the main screen. I tried a couple scripts before the new label system was put in place, but didn’t have much luck.